John is a stickler for timings. I don’t know if it’s because of his years in the military or his upbringing, but this man is never late for anything. When we have somewhere to be, he always makes us leave at least 30 minutes before I’d even consider heading out. It’s actually nice for a change and much less stressful. Here’s a big surprise though. For a man who is so focused on being punctual, he never wore a watch! He said they always felt uncomfortable and didn’t like having it rubbing against his skin. I figured he wasn’t happy with the traditional metal and rubber watches and maybe he would like a watch made out of a different type of material. 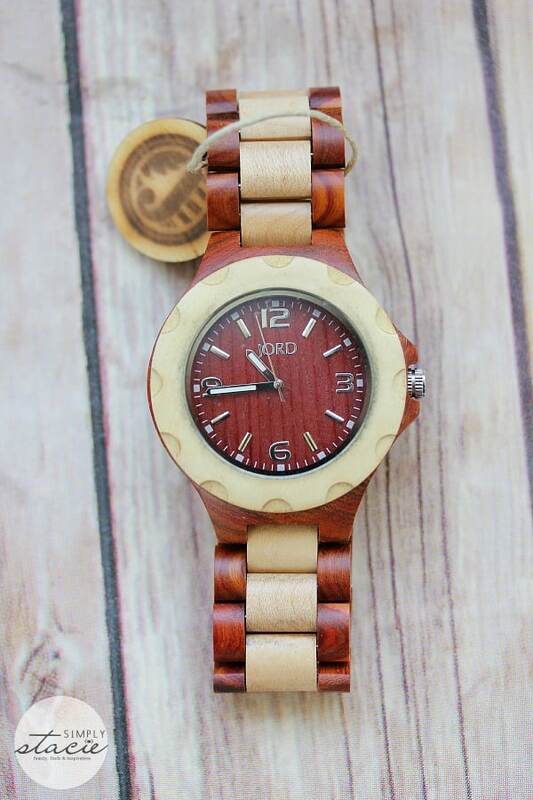 I’d never heard of a watch made of wood until I was recently introduced to JORD. They create wood watches using natural materials and are handcrafted. I thought John would like the fact that they are made out of wood since he is a carpenter by trade and works with wood all the time. JORD is actually Swedish for “earth, soil, land”. 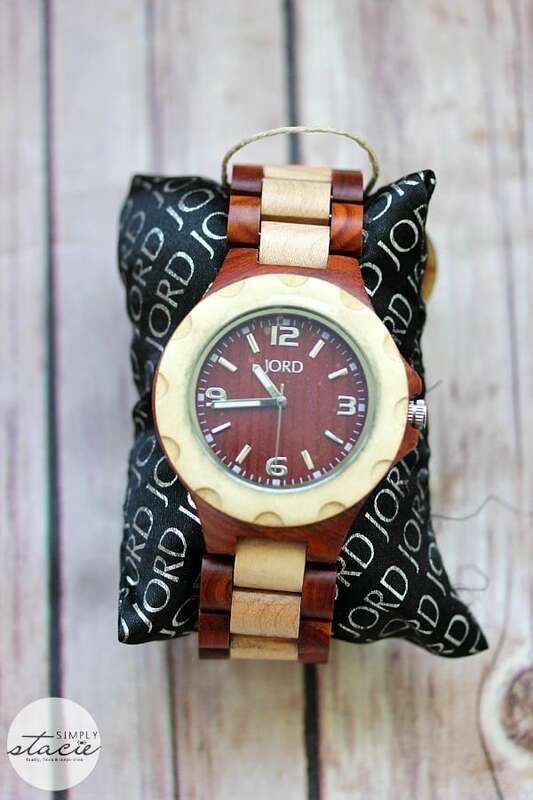 JORD uses a variety of 100% natural wood found all over the world to make their wood watches including bamboo, maple, sandlewood, blackwood, cherry and teak. I appreciate that they use sustainable materials to create these unique watches. The bands and movement housings are often made from one or more types of wood. As for the other materials, they are sourced from the finest international watch manufacturer. The glass on the watch is a scratchproof “blue film” glass. JORD doesn’t use any toxic chemicals to treat or protect the watch. John’s watch is the Sully Series Wood Watch made of cherry & maple. I figured he would want the watch made of cherry wood since that is his all-time favourite type of wood. It’s also a watch that he can wear all the time whether he’s being casual in jeans and a t-shirt of in a suit and tie for a special occasion. I think the contrasting colours of the two varieties of wood makes it both striking to look at and unique. He’s told me its a conversation starter when his friends see it and ask him about it. 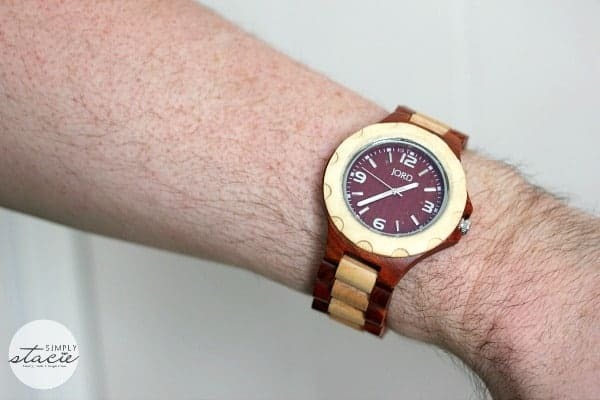 Most people where we live have never heard of a wood watch! John has been wearing his watch for a couple weeks now and remarked about how comfortable it is. He said he doesn’t even feel it and it’s like he’s not even wearing a watch. It’s very lightweight and doesn’t bother him at all. I think he has found his solution and now always knows what time it is. It was annoying when he would always ask me for a time-check! JORD watches are “splash proof” meaning you can wear them around water, but don’t submerge them. Take your watch off before jumping in the pool. That’s basically common sense though. JORD recommends using a mixture of simple (and natural) mixture of olive oil and lemon juice for cleaning. They explain it more in depth in the FAQ on their site. The Sully series in Cherry & Maple wood watch retails for $139 and you can purchase it (or their other watches) directly from JORD. They also ship internationally which is great news! Anyone in the world can own one of these beautiful watches. With Father’s Day coming up in a few months, I’m thinking a JORD watch will be the perfect gift for my father. If you decide to buy a JORD watch make sure to share it! JORD is asking people to hashtag their photos with #jordwatch on Facebook, Twitter and Instagram. You can have your photo featured on their site and be entered to win monthly prizes. The Ely is my favorite. My favorite is the delmar bamboo. i am tony l smoaks on rafflecopter. I liked 94A in chocolate. Very classy. ELY SERIES Natural Green & Maple the best. This is actually my favorite one, but I like the Ely too. The Sully Series Cherry & Maple is my favorite watch. I want the Ely Series- maple. I like the maple and small face! My favorite is the 746 series in Black. I like the sully watch. I love the Delmar watch! So stylish! Thanks for the giveaway…my wife like the Delmar series style ! 746 SERIES Black….my son would love this!! I like the Fieldcrest Black! I like the Sully Series Cherry & Maple the best.